Radium Engineering offers the industry's largest selection of configurable fuel surge tanks. Many customers who build custom street or race cars have limits on where they can package a fuel surge tank in the vehicle. It is often ideal to consider a fuel surge tank that can be mounted flat (or horizontally). So the question comes up; with the large selection of Radium Engineering fuel surge tanks available, which can be mounted horizontally? To answer that question, we have to look at the different surge tanks and how they function. Obviously, all Radium fuel surge tanks can be used mounted vertically. This is the optimum position as the fuel pump inlet is situated at the bottom of the tank, so the full volume of the surge tank can be utilized before the pump inlet is starved of fuel. But many can work equally as well when mounted horizontally. When mounting horizontally, we always recommend that any amount of positive angle be implemented (top upward) if possible, and NEVER at a negative angle (top downward). Mounting at a negative angle can trap an air pocket inside the surge tank, near the fuel pump inlets. Radium's collection of standard fuel surge tanks can be found HERE. These can be built with one or two internal pumps. When considering how to mount the surge tank, it is helpful to know what is going on inside. Shown above is a standard fuel surge tank equipped with a single fuel pump. All of the pumps we use are configured with the inlets situated in-line with the outlet (red line). This holds true for the Walbro and AEM pumps offered (39mm body pumps). On Radium fuel surge tanks, the green fittings always denote the fuel pump outputs. By observing where the green fitting is located, you can deduce where the pump inlet is and mount the surge tank with that side downward. Sometimes, clocking of the body of the surge tank is required in order to get the mounting holes on the correct side. This is done by disassembling the surge tank and reassembling with the canister in the proper orientation. With the green fitting downward, the opposite side fitting should be used as the return back to the OEM fuel tank or fuel cell (shown above). This allows any air pockets to get pushed out. When considering a standard fuel surge tank with twin internal pumps, it is a slightly different situation. As shown below, it is clear that pumps are on opposite sides of the surge tank. When rotated with one pump down, horizontal mounting increases the chances that the top pump may become starved, should the fuel level in the surge tank start to decrease. If a dual pump standard fuel surge tank MUST be mounted in horizontal configuration, it should be oriented as shown below, with the pumps side by side. This is not 100% optimal, but will work. In a situation like this, any sort of positive mounting angle will be very helpful to allow the surge tank to utilize its full volume as much as possible. 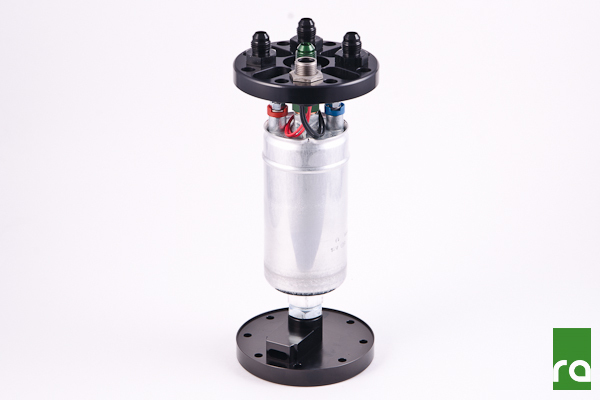 The standard fuel surge tank with the Bosch 044 fuel pump has a specially designed pickup machined into the base (shown below). This allows the surge tank to be mounted horizontally without losing effectiveness. Observe the labeling on the bottom of the surge tank for proper orientation when mounting horizontally. Avoid mounting at a negative angle. The family of Multi-Pump FSTs (MPFST) all must be mounted vertically or as close to vertical as possible within +/- 10 degrees. The FST-R is only available with a single internal pump (not compatible with Bosch 044). This pump is situated slightly differently than the standard fuel surge tank. When mounting this horizontally, be sure to have the correct side down according to the diagram below. Reclocking of the canister may be necessary depending on what side the mount will attach to. Once again, always avoid a negative angle (top lower than base) and always try to mount with as much positive angle as possible (top higher than base). Please contact info@radiumauto.com with any further questions. 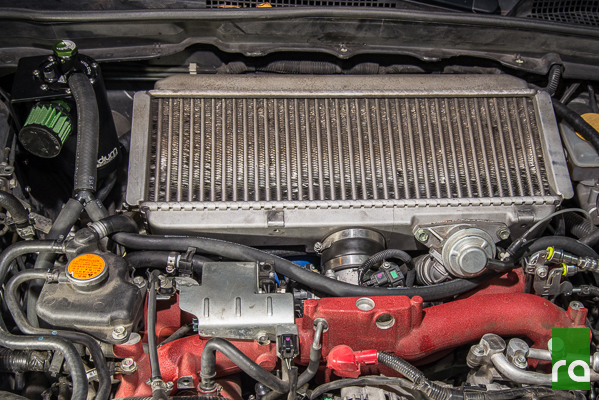 It is well known that Subaru engines are prone to excessive blow-by, creating a collection of oil and other contaminants in the intake system and intercooler. Do you ever see blue smoke in the rear view mirror? This is typically the contaminants getting burned through the combustion process. 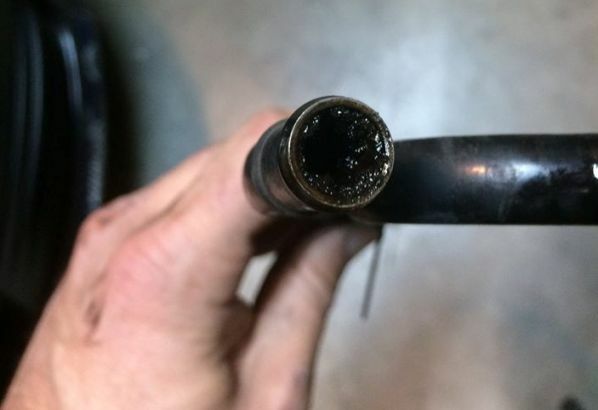 Shown above is a Subaru valve cover vent crossover pipe that is almost completely clogged with oil residue and carbon build-up. 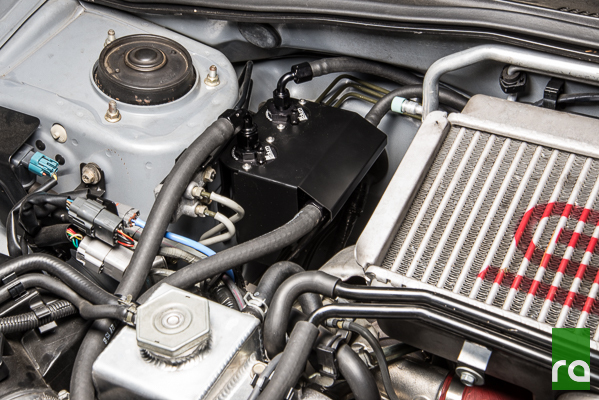 For street driven or lightly modified vehicles, a simple oil catch can system will often do the trick. 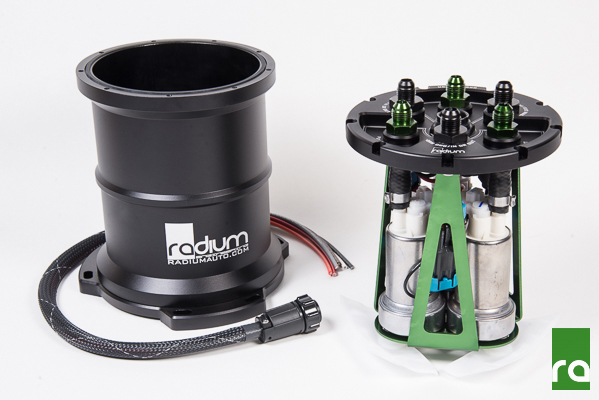 Radium Engineering has utilized its compact catch cans to created an integrated package for installation into various 2002-2014 Subaru engine bays. The catch cans are designed to collect and retain the oil and other contaminants, preventing them from being cycled back through the engine's air intake and intercooler system. 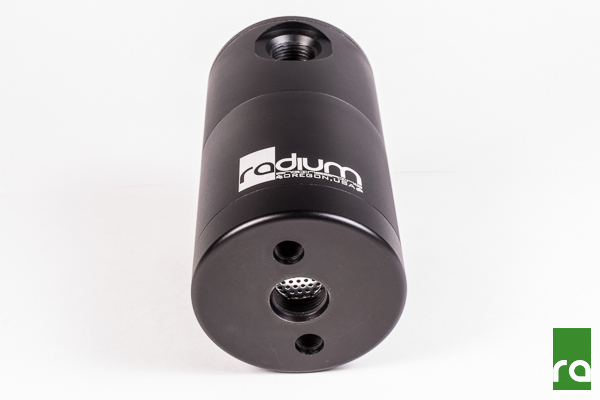 CLICK HERE to learn more about the Radium Engineering catch cans. As shown above, when the throttle is closed, the one-way PCV "check" valve opens. When the throttle is open, the PCV valve closes and all the crank venting is happening through the valve cover vents. 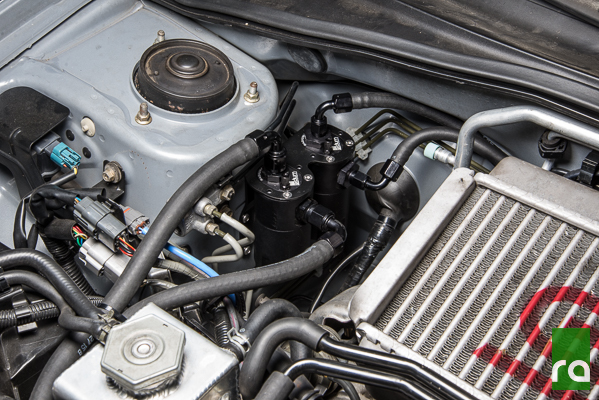 The air being sucked in by the turbocharger helps create negative pressure in the intake pipe, which then results in a mild vacuum to the crankcase vent catch can, to help draw out the gasses. In all engine load scenarios, the PCV system promotes negative pressure in the crankcase that can extend engine life. With the kit mounted in the area of the turbocharger, protection from heat is accomplished with a modular heat shield (shown above). This is necessary to keep the temperature of the catch cans down and help promote condensation of water vapor inside the catch cans where it is collected along with oil and unburnt fuel. The catch cans should be periodically checked using the dipsticks and drained as needed. To dispose the fluid, simply remove the 4 heat shield mounting bolts with a 3mm Allen wrench. The lower half of the catch can bodies unscrew for easy servicing. Always properly dispose of the contaminants. Do not pour catch can contents back into the engine oil. With a higher engine power output comes an increase in oil circulating through the crankcase ventilation system. Horizontally opposed engines, in particular, expel an excessive amount of oil through the ventilation system. In extreme cases, this may overwhelm the capacity of the standard sized catch cans during long track sessions. Instead of using a large reservoir to retain all the collected contaminants, the oil can be returned to the pan. However, this process must take into account several considerations in order to function properly. Shown above is the Radium Engineering Air Oil Separator (AOS). The AOS is built on the foundation of the Radium Competition Catch Can, but with a new specifically designed bottom plate. Full CNC construction, sealed with O-rings and anodized. The AOS still features all of the same oil baffling media found in the competition catch cans. However, instead of collecting oil, the AOS drains back to the engine through the large baffled -10AN ORB bottom port, shown above. The bottom plate not only features a large oil return port, it also functions as a heater to prevent water from condensing inside the can. The heater is fed by coolant circulating to/from the engine. The cooling fins, shown above, increase the effective surface area of the heating element. Also, if any water were to make it's way into the canister, it would be trapped underneath the lower density oil in the bottom trench. The center port baffle provides a layer of protection to keep debris from enterning the crankcase. For AOS crankcase plumbing, the valve cover vents are routed into the top inlet where the stainless steel condensing material separates the oil from the gasses. The PCV valve is removed and the system is no longer hooked up to the intake manifold (vacuum). The crankcase port in the center of the block (green arrows) is now routed directly to the AOS bottom port with a large diameter -12AN (3/4" ID) hose. The filtered liquid oil is collected at the bottom of the AOS and is drawn into the oil pan through the 3/4" hose. Meanwhile, the clean crankcase air can either be vented to atmosphere (VTA) or recirculated to the turbo air inlet pipe (see instructions for details) out of the side port of the AOS. The AOS completely disassembles for easy servicing when needed, as shown above. Because of limited vertical clearance, special low-profile banjo style fittings were developed for the Subaru AOS kit. These fittings are super compact, yet high flowing. They are machined from aluminum and anodized. Radium installation kits include all necessary parts for an easy bolt-in process. Shown above is the AOS system fully assembled with a Subaru specific mounting bracket and fittings. When installed, the valve cover vent lines "Y" together and are plumbed into the top port of the AOS can. The side port is used as the vent to atmosphere (VTA), or it can be routed to the turbo inlet pipe for a closed system. The bottom port of the AOS can is plumbed with a 3/4" hose to the crankcase vent port on top of the block. This line acts as a way for crankcase gasses to enter the AOS, but also functions as the path for oil to return back to the oil pan. Both Dual Catch Can and AOS kits are available for the Subaru WRX, WRX STi and Forester XT in the 2002-2014 model year range. Contact info@radiumauto.com with any questions.